Poised perfectly in Central Park among her woodland friends, Alice in Wonderland is the epitome of femininity and whimsy. 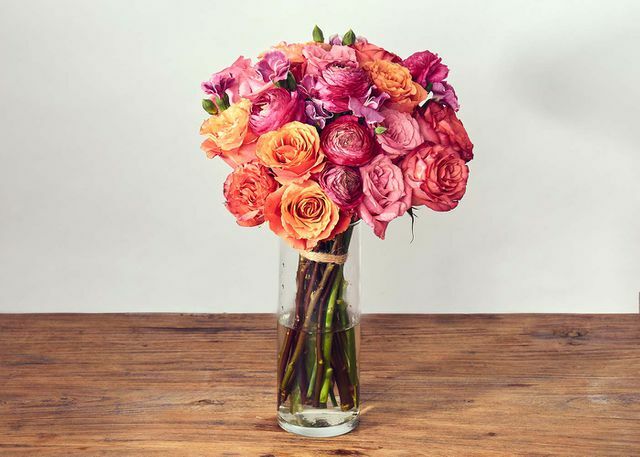 This Flower Flash inspired arrangement evokes the same girlish beauty. Using similar flowers found in her 30 foot long floral boa, these sumptuous and fluffy booms feel urban and romantic, all at the same time. A Flower Flash is an urban street art installation created by Lewis Miller and his team of merry, floral bandits. The New Yorker coined Lewis, The Banksy of Floral Design as these Flower Flashes are created under the cover of darkness, usually before dawn and always with living flowers. Using trash cans, construction sites and iconic statues all over New York City, Lewis makes these random acts of flowers and kindness simply to bring joy to everyday New Yorkers. The installations are fleeting but the feeling of goodwill lasts. By purchasing this Flower Flash inspired arrangement, you too are creating an act of goodwill. A portion of the proceeds go to ProjectArt, an organization that empowers youth through free after-school arts education.